When I went to bed last night..I had every intention of going to work but when I woke up this morning..my body had other plans in mind..stay in bed and recover! 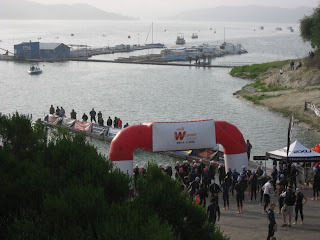 Read on about my Wildflower Half Iron experience.. I woke up Monday AM panicking with the pain I felt on my left hip when I walked. Talked to Coach Alex on the phone..he had me do some exercises in diagnosing me..told me I probably over worked it last Sat and for me to not run until Wildflower on Saturday. By Wednesday..pain went away! Phew! I spent all week eating a relatively "clean" diet..no candy..sweets..junk food to prep my nutrition for Wildflower weekend. I had done the course in it's entirety during a training weekend with Ironteam but I signed up to do the Long Course (1.2 mi swim, 56 mile bike, 13.1 mile run) Official Event as a training day to work through my race day nutrition and just go through the motions of being at race events. Friday AM..Hez comes over..we load up my car and on our way to Lake San Antonio we went! Saw Alex on Highway 101 and we caravaned together for the remainder of the way. Arrived at 11am..thanks to Nick and Ted for setting up out tents! Spent the rest of the day getting our race packets and exploring the expo. At the race packet pick up..there were 7 age group lines for the men and only 3 lines for the women! Of all the athletes racing the Long Course..only 30% were women! What a ratio! The Olympic and Sprint ratio is a lot more even. Sat AM- the day has come! Swim- Transition area on Friday was empty..Sat AM..it was mayhem with about 3000 people setting up! The swim course- starts from the big red chute..swim out rectangularly to the triangle bouys and back. 1.2 miles! 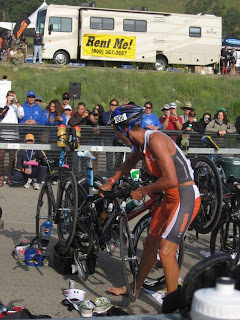 2007 IM Kona Champion- Chris McCormack- eventual 2008 Wildflower Long Course winner at T1. I went into this weekend with the intention of using this event as a training event but felt race like emotions as the day went on. I was pretty relaxed through the day about the race.. until about 10 minutes before my age group was to enter the water. I think before any race..most people just want to be alone..get in their visualization..etc. My buddy Anthony spotted me about 10 minutes before my start..I was getting a little nervous..gave him everything that I didn't need..my water..my extra cap..etc! Warmed up in the water for a little bit..water was beautiful! Lined up on the right hand side..had a quick conversation with the girl next to me about how much we hated swim starts! 9:15am..horn went off..swim starts! The swim went surprisingly smooth for me! I didn't go off course as much as I had expected..my sighting was pretty good for the most part..tried to keep my heart rate in control. This girl with a sleeveless wetsuit next to me swum stroke by stroke next to each other for most of the swim. 46 minutes and 52 seconds later..I was out of the water! T1..took a little longer than I wanted but I was pretty happy with my swim as I took 7 minutes off of my training weekend swim time! Bike- was a bit tougher than training weekend with the temperature much warmer and the women having a bike cut off time to race against. Since the female waves start after the men..we have about 4.5 hours to finish the bike course. I find that the bike portion really screws with your mind! I was out there playing mental mind games with myself for most of the ride! I was at mile 5.5 when I saw Chris McCormack (eventual overall winner) finishing his bike at 3rd place behind Bjorn Andersson (last year's winner) and Chris Lieto (came in 3rd overall). The bike was long but I knew that going in! Nasty Grade was tougher than it was a month ago..as I was riding up..I saw three men walking their bikes up that climb thinking.."come on guys!" I saw Steve C. finishing up his run as I was flying down Lynch Hill finishing up the bike. 4 hours and 42 seconds later..I was off the bike! When I saw Steve the next day..he said you were going so fast down Lynch..I said..I was so over the bike ride by then..I just wanted to finish it! T2..Went a bit better than T1. The girl two bikes over was just standing there looking at her stuff. I asked her what she was doing and she said that she didn't want to do the run. I said..you gotta go! You trained for this..come on..let's go! Run- was good up until about mile 4 or 4.5..when I rolled my left ankle on the trails..fell over and scraped up my right knee. Felt my ankle numbing for a few seconds..then got back up and continued the run portion. The range of emotions I was feeling after the spill varied! Knowing that I still have to tackle the "are you f*cking kidding me" (a.k.a. 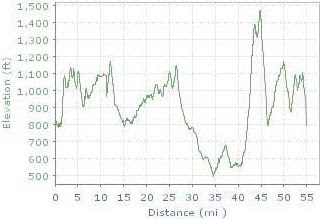 big steep hill at mile 5.5) part of the run was not encouraging. I ran a little on the flats trying to nurture my ankle and walked the hills but there was no way I was going to stop and not finish! I saw Susan, Tessa and Heidi cheering at mile 7.5 up the hill through the TNT campsites. I saw Anthony and Mike a little bit after that. Anthony came and ran with me for a bit. I almost burst into tears when he asked me how I was doing. That moment really surprised me..I didn't know I had THAT much emotions bottled up through the day! I saw Rosie and Anna at the pit..and Emma Louise shortly after who walked with me from mile 10.5 to 12. 3 hours and 14 seconds later..the 13 mile run..well walk was over! I was really bummed about my little mishap at mile 4 but it could have been a lot worse..so looking on the brighter side! Crossed the finish line..saw Kristie..headed into the medical tent to get my knee cleaned up. A big thank you to medical guy Mark who was really nice and gentle in cleaning out all the dirt that was stuck in my bloody knee. I was biting on my finisher's towel.. trying really hard not to squirm while he rinsed..sponged and bandaged my knee. The lady next to me from LA Tri kept conversation with me to keep me distracted..found out that her sister is my neighbor! Small world! Overall, the race atmosphere and weather (well and my fall) made it so much tougher than training weekend. 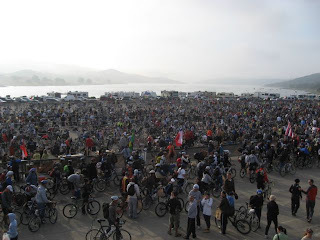 The Wildflower Long Course race is HARD yet I now understand why people keep coming back to it! It's tough..heck it's considered to be the toughest half iron distances in the world..it's a long day..unknown emotions are bottled up but it's fun with one of the best race atmospheres ever! I commend and respect everyone who has tackled that course on race day! All I am thinking now is..what is Ironman going to be like?! My Wildflower collection of finisher medals are not complete..I did the Sprint as my first triathlon in 2002, finished the Olympic Distance last year with TNT and now the Long Course with Ironteam. Despite a hard day..it was an extremely fun weekend sharing laughs with friends and putting myself through a physical and mental test! Btw, if you have an aero helmet and/or Hed wheels decked out on your bike..you're NOT allowed to walk the hills..not Beach..not Nasty Grade and definitely not Lynch! Phew..got that out of my system :).